Trick or Treat Microgaming Classic Slot Guide & Review - Casino Answers! 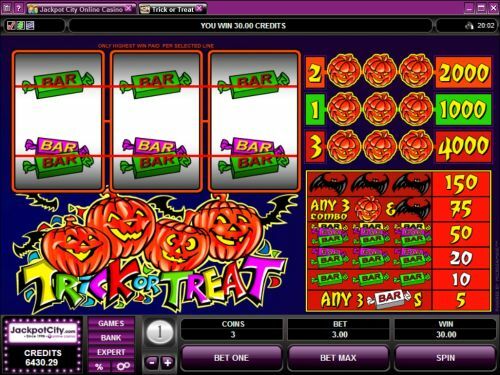 Trick or Treat is a 3-reel, 3-line classic slot machine developed by Microgaming. You can play the Trick or Treat classic slot game at Bovada. Coin values on the Trick or Treat slot machine are $0.25, $0.50, $1, $2 and $5. You can bet 1-3 coins per spin. For each coin you play, you will enable one payline. Trick or Treat is a quarter slot, meaning you bet as little as 25 cents per spin when you play or you can bet as much as $15 per spin. To play all the 3-coin maximum bet on the Trick or Treat slot game (which we strongly recommend), hit the “Bet Max” button. To play Trick or Treat with any other bet, hit the “Spin” button. The highest paying symbol on the Trick or Treat slot machine is the Jack-O-Lantern symbol. If you hit 3 Jack-O-Lantern symbols on the third payline, you will win the 4000 coin top jackpot. On paylines 1 and 2, you will win 1000 coins and 2000 coins respectively for the same winning combination. You can win lots of cash if you hit this winning combination when you play Trick or Treat at Bovada. There are 7 winning combinations on the Trick or Treat classic slot machine. The full payout schedule is as follows (1/2/3 line payouts in parenthesis when applicable): any 3 Chocolate Bar symbols (5), 3 Single Chocolate Bar symbols (10), 3 Double Chocolate Bar symbols (20), 3 Triple Chocolate Bar symbols (50), any combo of 3 Jack-O-Lantern and Bat symbols (75), 3 Bat symbols (150) and 3 Jack-O-Lantern symbols (1000/2000/3000). Hit “Expert” and you will gain access to the Trick or Treat autoplay mode. You can either play 5 or 10 autoplay spins or you can set advanced settings. Advanced settings include number of spins (5, 10, 25, 50, 100, 250 or 500), number of seconds between spins (0.25, 0.50, 0.80 and 1.50), stop once all spins are complete, stop when jackpot is won, stop if a win exceeds or equals ($25, $50, $100, $250, $500, $1000 or $2500), stop on any win or stop if credits increase/decrease by ($25, $50, $100, $250, $500, $1000 or $2500). You can stop the autoplay mode on Trick or Treat at any time. Trick or Treat is a simple Halloween classic slot machine with no special features to speak of. If that is all you’re looking for in a slot machine, then you can play the Trick or Treat slot machine when you sign up and make a deposit at Bovada. What is the difference between the Trick or Treat classic slot games? The Vegas Tech Trick or Treat slot has more special features and can be played by USA players. You can play the Vegas Tech version at Bovada. Can USA players play the Microgaming Trick or Treat online slot? No, players based in the United States of America cannot play the Trick or Treat slot machine at Microgaming casinos. However, American players can play the Vegas Tech version at Bovada. Can I play a free Flash game of the Trick or Treat slot machine? Yes, you can play the Trick or Treat classic slot game at Bovada. You can play for free or play for real money. If you experience any problems with the Flash software, you can download the latest version of Adobe Flash Player. What other Halloween slot machines can I find at online casinos? If you’re into witches, ghosts, ghouls, monsters, vampires, zombies, werewolves and candy, you can read our list of Halloween-themed slots for more Halloween slot reviews.